Lories are very active birds and playful by nature and appreciate a variety of Bird Toys / Entertainment, including ropes, bells, balls, and swings. The minimum cage size for a single lory should be 36" H x 48" L x 24" W or to accommodate a pair the cage dimensions needs to be, at a minimum, 36" H x 60" L x 36" W. You have to remember that you need room for the many toys that lories so cherish, perches, food / water dishes, maybe a "birdy tent" -- as well as providing sufficient space for them to move around, exercise their wings. etc. 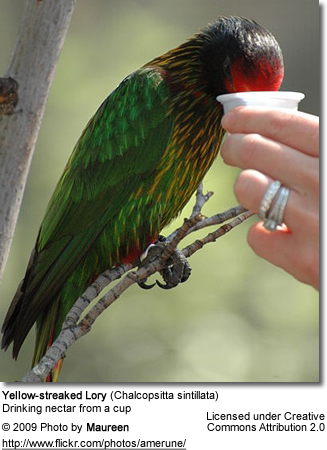 Care should be taken in cage design and placement since the birds have a tendency to squirt their waste matter, which is fairly liquid, behind them with some force. It is not recommended to place the cage behind a delicately decorated wall and on unprotected carpet. Easy-care flooring is recommended, as well as a washable wall. An acrylic panel custom-cut and placed over the wall would be a great way to protect it. The acrylic panel can easily be taken outside and hosed down. There are acrylic cages available, but lories love to climb and scramble about, so a standard, high quality powder coated cage is a better choice - as large as the space you have will allow. In an outdoor aviary they are the easiest birds to maintain, as all of their waste can simply be hosed away, no seed hulls to sweep up or sticky, green and white droppings running down the side of the cage to scrub off. Lory droppings are mostly clear or beige. A word of caution about placing lories in mixed-species aviaries. Some lories can be very aggressive toward other birds, while others get along with other birds, as long as their territory is respected. Mated pairs defend their territories vigorously. The worst "offenders" is probably the Chattering Lory. They seem to take great pleasure in doing in other birds in their territory. In the wild, the bulk of their diet consist of nectar, flowers, fruits, pollen and seeds. Previously, anyone keeping lories created their own version of "lory diet" and everything had to be made from scratch every few days at least. Unfortunately, very few breeders fully understood the nutritional needs of these birds, and many perished before their times due to nutritional diseases. Nowadays, several commercial feeds have been developed and are readily available, which greatly facilitaties the process of feeding these parrots. They are easy to use -- as most of them just require you to add water (for the nectars) or are fed dry. These diets were developed by professional nutritionists to meet dietary requirements. An all "dry" diet is not recommended. If this is the predominate factor in the diet, fruits and plenty of fresh water should be provided. Lories will not do well on a diet too high in protein. 15% should be the maximum. They are highly susceptible to gout and suffer kidney and liver problems. They should not be fed an amazon type of diet, as they are full of legumes and contain too much protein. Their recommended diet consists of commercial or home-made nectar. Liquid nectar will need to be replaced several times daily. In warm weather every four hours. The main causes of premature death in lories are infections caused by spoiled nectar and/or a poorly balanced, one-sided diet that doesn't meet the special nutritional requirements needed for good health. Liquid nectar will need to be replaced several times daily - in fact, in warm weather it needs to be changed every 4 hours. Another healthful addition to their diet are flowers, including pansies, nasturtiums, roses, hibiscus, marigolds, and dandelions. All fruits, veggies and flowers should be pesticide free. Organic is always best. Other food items include brewer's yeast, oat flakes, multi-grain flakes and small quantities of millet spray; oats, canary grass seed; some sunflower (sprouted). If a balanced nutrition can't be met, vitamin and mineral supplements may need to be provided.